The late Geoffrey Gurrumul Yunupingu, the blind Yolngu Orpheus who "can see with his heart"
How I long to get to Elcho Island! For this generous, ceremonially dynamic community of Yolngu tribes-people willingly sent out their blind son into the world to promote its culture. There was no way he was ever going to even attempt to explain it in words – he was almost catatonic when asked questions in English in public – but his Yolngu-matha songs have somehow given the wider world a greater insight into their world than almost anyone before. 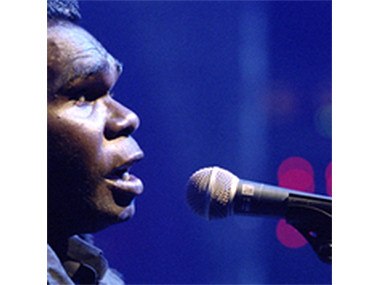 And having introduced us to this world with quasi-Western music co-written with his bassist partner, Michael Hohnen, made incredibly special through his honeyed voice, Gurrumul leaves us (having died in 2017) with a new record that digs deep into his ceremonial reality – the chants that go with the dances and body decoration that celebrate and make sense of life and death to remote Aborigines. To ease the non-Indigenous listener's ears into this experience, Gurrumul, with his Skinnyfish Records interpreters Hohnen and Mark Grose, has added a Western classical backing with more than a suggestion of composers such as Arvo Part and Phillip Glass. Oddly, David Page, the great inter-cultural composer for Bangarra never seemed to need such back-up when harnessing fellow-Yolngu, Djakapurra Munyaryun's intense basso chanting. But then, of course, Gurrumul's Yolngu music is classical too. Australian classical. And, coincidentally, the Noongar novelist Kim Scott, winner of not one but two Miles Franklin Awards, is determined to gain acceptance for that word 'classical' to represent this country's 60,000-year-old culture. For, he points out, if something is accepted as classical, there's always room for a renaissance that embraces it and takes off. I shall endeavour to recognise the untrained artists of remote Australia henceforth as classical. Not for Gurrumul, as we see in the documentary film of that name, the colourful, iconoclastic life of an 'Amadeus' or a Beethoven. The child who was expected to live a sadly dependent life by his family because of his blindness from birth (and we get a taste of that blindness through a conversation over a blank screen), gained acceptance and the beginnings of independence through his determination to be a musician – even if he played his guitar upside down. He was taken into his cousins' band, Yothu Yindi; later he joined the Elcho Island-based Saltwater Band. 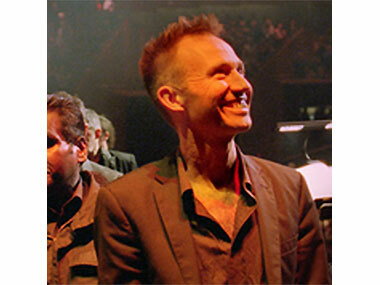 That's where Hohnen and Grose found him – barely noticed behind hyper-active lead singers and guitarists. But something said he had an undiscovered solo talent – though it was seriously un-Yolngu to want it for himself. It seems to have taken 12 years from 1996 to his first solo concert (in Darwin, I believe, not Sydney's Enmore Theatre as the film claims) in 2008 for the butterfly to emerge from its chrysalis. But then nothing was predictable in this career which took him to meet the Queen thrice, to play a fraught gig with Sting, the only imaginable non-Indigenous match for his voice, and to tour Europe and America eventually. Sorry business, of course, played a part. The need for an open phone to talk to his parents and the wise old Aunt Susan, who explains much of Gurrumul's difference to us, and the right to simply not turn up for the big US tour that's going “to make your boy”! It turns out that his nephew was being initiated on Elcho. But that doesn't explain why he's not bothered to tell even Hohnen of his changed mind; for Hohnen is almost as intimate as a lover with this man/boy, though they call each other Wawa – brother. In fact, one of the thoughts that sprang strongly from the film for me was, “What will Michael Hohnen do now without his wawa?”. The last record is out - 'Djarimirri' - the film, finished in 2017, can now be released after appropriate mourning. The person who gave him so much pleasure (what a smile) and occasional pain is no more. Will 'Djarimirri' have a life of its own? For clearly Hohnen, and Western art music composer/performer Erkki Veltheim believe they are doing something special in bringing the ancient chants to our ears in a more accessible form. I'm not sure I totally agree. Certainly, the transcription of yidaki rhythm to Julian Thompson's cello works pretty damn well – but, hey, the yidaki might have been even better! And the minimalist repetition of the strings does feel as though it's in accord with Gurrumul's chanting (and he agrees it is), but I'm not comfortable with the brassy additions. However, Hohnen in the film comes up with a powerful metaphor to justify all the effort. “If a tile fell off the Opera House roof (where we've just seen Gurrumul and Hohnen enjoy a standing ovation) every day, we'd soon demand action to preserve our 'national treasure'. Well, every day, we're losing a song or a language from our classical culture, and no one seems to be noticing”. Perhaps they will also increasingly demand a sighting of the untrammelled culture from Elcho Island (and all over the North) to be seen more often in the ignorant South? The dynamic joy and total participation in ceremony from barely walking youth to the wheel-chaired aged is such an incandescent experience, as I enjoyed on Groote Eylandt way back in 1985 at one of the three great pan-tribal dance festivals organised by the Aboriginal Cultural Foundation. Even on film it's worth enjoying – especially when captured so brilliantly by cinematographer Katie Milwright. And even when it's a wake they're holding – for the life of the dead is clearly worth celebrating. All without drink, on dry old Elcho. Perhaps Michael Hohnen can make that ceremonial transition from North to South his next project. Barangaroo in Sydney? 'Djarimirri' has just been released by Skinnyfish Records. 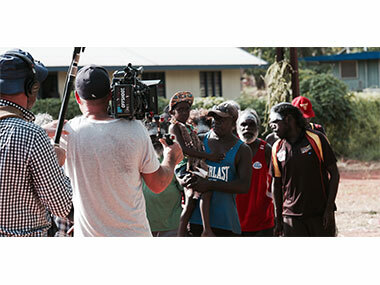 “Gurrumul' the film screens from 25th April.